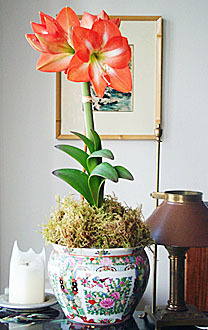 Celebrate the summer with a gorgeous salmon-hued Amaryllis. This hybrid's trumpet-like blooms open in succession for up to 4 weeks. Native to South Africa, our beautiful Amaryllis is grown along the California coast. An exotic Chinese porcelain cachepot provides the perfect accent. Own both of them now and enjoy! To learn more about the container, click CACHEPOT or choose below.